Current UK Barn Owl population updates. 25/04/19 A pair reported to be roosting together and copulating in Cornwall, but no egg-laying yet. 19/04/19 More typically in North Devon, the first egg of a clutch was laid today, just 2 days later than the average for the south west region. 23/03/19 Report of a female starting to lay, eventually finishing with a clutch of 5 eggs in early April in Cambridgeshire. 05/04/18 The first egg has been reported to us today, from a site in North Devon. This is something of a surprise after all the cold and wet weather Devon and Cornwall has experienced recently. This included officially being the wettest two counties in the whole of the UK in March, as well as receiving significant snow falls the same month from the ‘Beast-from-the-East’ 1 and 2. Let’s hope this is a sign of a good small mammal population that’s only going to increase as the weather improves. 21/07/17 With all ringing results now finally in it seems 2017 has been another relatively disappointing year, with nesting occupancy rates slightly below average, but brood size slightly above. Fortunately the weather has been rather fine, otherwise it might have been worse. 31/05/17 The first half a dozen annual monitoring visits have been conducted, revealing 2 young broods of 4 and a female only at incubation stage. Initial optimism for a good breeding season has been tempered but not entirely quashed. 14/04/17 Another pair in the north of Devon has begun to lay a clutch of eggs. The Cornwall Nestcam birds finally stopped at 7 eggs, a bigger than average clutch size. Are these the first signs it could be a reasonable breeding season? 30/03/17 The Nestcam birds in Cornwall have laid their first egg, some 18 days earlier than the average First Egg-laid Date for the south west. 09/02/17 The ‘State of the UK Barn Owl Population 2016’ report is almost ready(!) and should be available by 23rd February 2017. Having crunched most of the data, it looks like 2016 was a another poor year for Barn Owls but with a lot of regional variation. 13/09/16 Amazing results just in from the Isle of Wight: every nestbox checked (n=44) contained young!! A nesting occupancy rate of 100% is extremely unusual. Average brood size was 3.52 (compared with a national all-years average of 2.84). It remains to be seen whether these results have been repeated elsewhere. 27/06/16 Not good news, sadly. 45 site visits in Devon have revealed that (so far) this is looking like another poor year for Barn Owls with egg laying rather late, nesting occupancy at about 30% and mean brood size likely to be about 2. This compares to all-years averages of 35% and 2.89 respectively. If by any chance we have fine weather that persists well into autumn we could see some late breeding attempts which might mean we end up with an average year. It is too soon to say whether these early indications are typical of the UK or not although we have just today heard of a brood of five almost fully fledged in South East England. 27/05/16 Indications are that this is not an early year. We carried out our first Annual Monitoring Site visits in North Devon yesterday. Pairs were still on eggs, just hatching, or brooding very small young. Therefore, most nest monitoring visits will not start in earnest until mid June. By the end of June we should be able to gauge this years nesting occupancy and brood sizes. 08/03/16 Our third State of the UK Barn Owl Population report for 2015 is now available. 32 independent monitoring groups checked almost 6,000 potential nest sites. Overall 2015 was a poor year for Barn Owls in the UK and the geographical variation in nesting occupancy and brood sizes was less than expected. 22/01/16 We are currently collating results from 26 independent Barn Owl monitoring groups from across the UK in preparation for publishing the State of the UK Barn Owl Population 2015. It’s looking like 2015 was a year of extreme variation. Barn Owls in the east of England had a terrible year, even worse than 2013, whereas those in the west had an average or better than average year. Adult mortality in eastern counties was not too bad but nesting success was generally very poor indeed. 01/07/15 We are still in the process of carrying out our annual monitoring visits for 2015, but early indications are that it is a good year. We have found nesting at 63% of the sites checked so far this year, compared to an all year average of 51%. The average brood size for 2015 so far is 2.8 owlets per nest, slightly down on the average of 2.9. Unfortunately, we have seen several instances where nest site mortality has been unusually high. A certain amount of mortality is typical and is usually related to food supply. Peaks in mortality are often attributable to unfavourable weather conditions which limit the adult birds’ ability to forage. This year, there appears to be no weather-related reason for this unexpected peak in mortality. One possible explanation is that the very high rates of nesting occupancy following last year’s excellent breeding season suggest a very high proportion of this year’s nesting pairs are inexperienced first-year birds, that are simply less competent parents. Overall, even with the high mortality rate driving down the average brood size for this year, it seems that the unusually high number of nesting pairs will make up the shortfall. Please bear in mind that this is very much an interim assessment and will be subject to change. Full results will be published in the State of the UK Barn Owl Population 2015, at a later date. 12/04/15 First report of an egg laid today by a pair of Barn Owls in North Devon. 03/04/15 First report of Barn Owl eggs having been laid at a site in the north west. 09/02/15 The State of the UK Barn Owl Population 2014 is published today. 23/01/15 The State of the UK Barn Owl Population 2014 report is currently in production. So far 20 groups have kindly contributed their results and a further 3 are in the pipeline. Publication due February 2015. 08/10/14 An independent Barn Owl worker in one Lincolnshire parish has found 23 nestboxes containing a total of 100 young. That’s an average of 4.3 young per nest compared to the Lincolnshire all-years average of just 3.1. This is yet another indication that 2014 has been an extremely productive one no doubt due to a combination of higher than average small mammal abundance and favourable weather conditions. 15/07/14 In Devon and East Cornwall the number of breeding pairs is slightly to moderately down on the all-years average and the number of young produced this spring/summer is very high indeed. Nesting occupancy is 44% compared to an all-years average of 51% and mean brood size is 4.1 compared to an all-years average of 2.9. 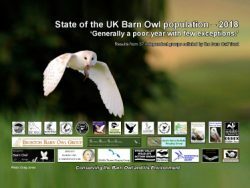 2013 State of the UK Barn Owl Population 2013. 2013 was an extremely poor year for Barn Owls – described as ‘the worst year since records began’. This prompted the Barn Owl Trust to collate results from 26 independent Barn Owl monitoring groups around the UK. All groups reported a drop in the number of breeding pairs. The drop in numbers varied from a 24% decline to 100%. The overall drop in nesting occupancy was 70%. Happy 30th Birthday – Barn Owl Trust!